France-based Lectra that offers hi-tech solutions to fashion firms world over has introduced the latest version of its PLM solution, ‘Lectra Fashion PLM 4.0’. The newest version of the software is more readily connected and configurable. This will allow fashion firms to operate in an even smarter way. For Fashion PLM 4.0, Lectra has created Lectra Easy Connect, a series of pre-configured connectors that permit the software to connect with other IT systems such as Enterprise Resource Planning (ERP) and Customer Relationship Management (CRM). The role of these connectors is to allow data integrity by providing a smooth and consistent flow of data between internal and external supply chain actors. Additionally, the company has improved connection to the design process by firming up Adobe Illustrator integration through a new plug-in which will allow designers to take advantage of the increased access to platform data like bitmap, PDF files and photographs. Lectra has made its PLM solution exceedingly configurable by adding a new tool named, Lectra Easy Configure, which will allow users to manage data according to their own profile, company and data arrangement for an easy and 24-hour access; thus allowing companies to be more agile. Not only does the new version streamlines daily operations via an restructured interface with new search and notification functions. With this update, users will get alerts and information about styles and materials. 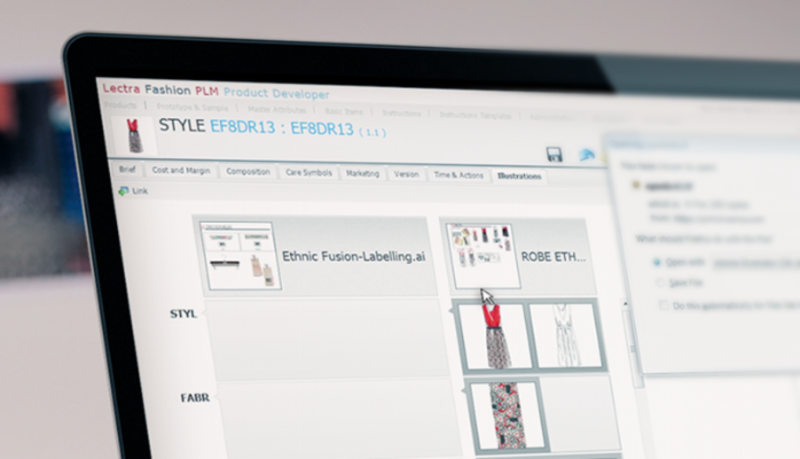 “We have already created Lectra Fashion PLM 4.0 as the go-to PLM solution for fashion companies in the digital era. We have entered a brave new world and ever since its launch, we have kept an open ear for our customers. By listening to their feedback and making this version more connectable and configurable, we are actually merging human and artificial intelligence to give them what they need. And they, in turn, will give their consumers the products they want,” said Céline Choussy Bedouet, Chief Marketing and Communications Officer, Lectra.